Overall, the solar workforce has grown 159 percent since the first Census was released in 2010, adding nearly 150,000 jobs. 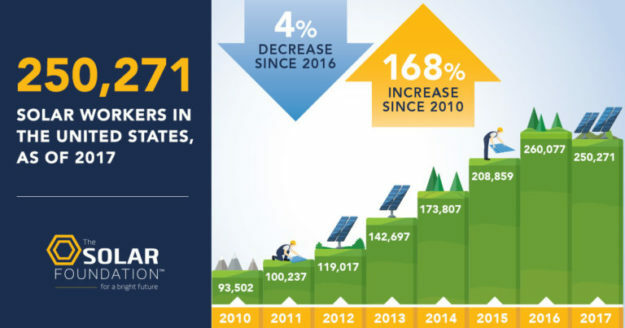 While solar employment nationwide fell 3.2% for the year, with a backlog of utility-scale projects and new policy incentives in key states, survey respondents predict that solar jobs will increase 7 percent in 2019, bringing the total to 259,400 jobs. Despite these recent challenges, though, many emerging markets saw solar job growth in 2018, and the U.S. solar industry’s long-term growth trajectories remain strong. 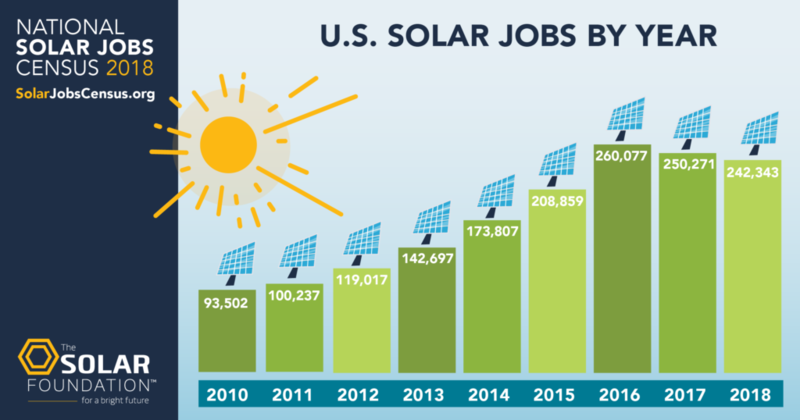 The Solar Decade is upon us, and the dozens of gigawatts of new solar capacity the U.S. is poised to add will be accompanied with quality job opportunities for all Americans in each of the 50+ states and territories. Dan McGuire is director of the American Corn Growers Foundation. He lives in Lincoln. This entry was posted in NewsBlog and tagged Solar Energy Industries Association (SEIA), solar energy jobs increased in 29 states, The Solar Foundation, The Solar Foundation's National Solar Jobs Census, U.S. solar industry’s long-term growth trajectories remain strong on February 12, 2019 by Helen Deffenbacher. With every new solar-on-schools contract more people learn how it’s done, share what they know, and make it easier for neighboring school districts to follow the same path. U.S. schools could host up to 30 gigawatts of solar. Read the entire article here. 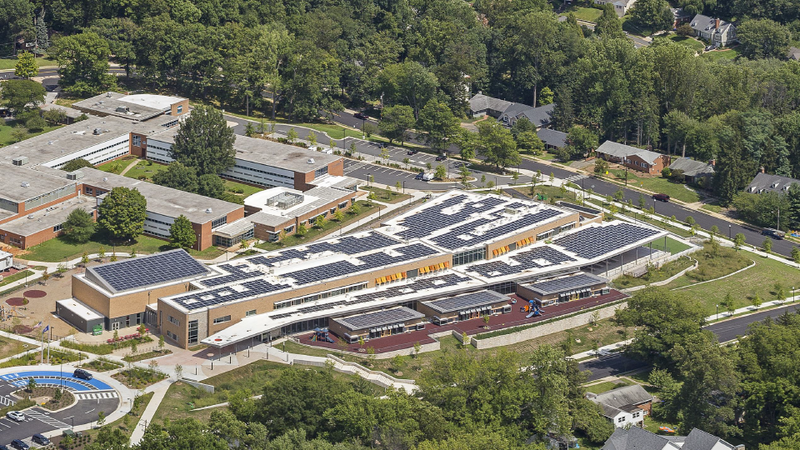 Image Credit: Arlington Public Schools: Rooftop solar on an Arlington, Virginia school. 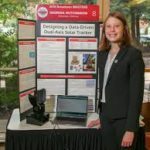 Georgia Hutchinson, from Woodside, California, took the top prize at the Broadcom Masters nationwide STEM competition for middle-school students. She is working on patenting her invention. This entry was posted in Nebraska / Midwest News, Solar Energy Education, Solar Schools and tagged Generation 180, nationwide solar schools initiatives, Nebraska Solar Schools, Nebraskans for Solar NewsBlog, Solar Energy Industries Association (SEIA), The Solar Foundation on December 18, 2018 by Helen Deffenbacher. Wind turbines have become a familiar part of the landscape in the rural Midwest, and with them have come jobs, income for farmers and tax revenue for communities. They’re one sign of how the clean energy transition is helping to transform areas that sometimes struggle to attract jobs and investment. A new report from the Natural Resources Defense Council shows the extent to which clean energy is contributing jobs to the rural economies of 12 Midwestern states. It also reflects what the rural Midwest stands to lose from Trump administration actions that harm clean energy, such as its recent call to eliminate subsidies for renewable energy, its tariffs on solar energy equipment, and its plan to weaken the Obama-era Clean Power Plan. The authors say the numbers underscore the need in the Midwest for government policies that are supportive of clean energy instead. Read more here. Dan Gearino covers the U.S. Midwest, part of Inside Climate News’ National Environment Reporting Network. His coverage deals with the business side of the clean-energy transition, and he writes Inside Climate News’ Clean Economy Weekly Newsletter. This entry was posted in Nebraska / Midwest News and tagged Center for Rural Affairs, Dan Gearino, declining costs of solar and wind energy, DOE's Solar Training Network, economic benefits of renewable energy to local communities, Inside Climate News, Midwest clean energy jobs, Natural Resources Defense Council, Nebraskans for Solar NewsBlog, policies that advance clean energy development, The Solar Foundation on December 7, 2018 by Helen Deffenbacher. 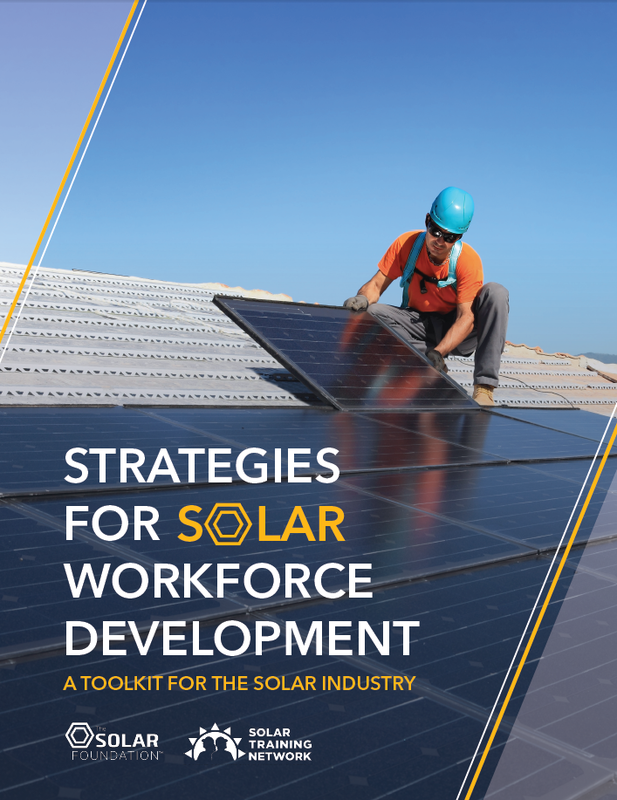 Strategies for Solar Workforce Development: A Toolkit for the Solar Industry was published by the Solar Training Network, a program The Solar Foundation leads that is funded by the U.S. Department of Energy Solar Energy Technologies Office. The toolkit is designed to help meet the high demand for qualified employees and build a skilled and diverse solar workforce. Written for both large employers and small solar businesses, the toolkit includes a detailed guide for setting up work-based learning programs to invest in current and future workers. This new toolkit includes a Workforce Development Action Plan showing how solar companies can partner with local workforce development boards and American Job Centers to support the hiring, recruitment, and training process. The toolkit also includes a step-by-step implementation guide for building a work-based learning program, including internships, apprenticeships, and on-the-job training. 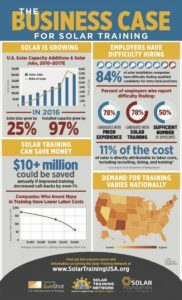 In this op-ed for pv magazine, The Solar Foundation’s Chris Walker explores issues of aligning solar training programs with workforce needs. 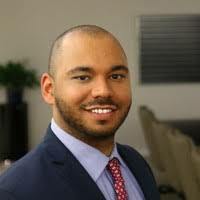 Walker is Senior Program Manager for the Solar Training Network at The Solar Foundation, a nonprofit organization dedicated to advancing the use of solar and solar-compatible technologies worldwide. This entry was posted in Nebraska / Midwest News, NewsBlog, Solar Energy Education and tagged American Job Centers, Chris Walker - Program Manager for the Solar Training Network, local workforce development boards, solar energy jobs, Solar Training Network, solar workforce development, The Solar Foundation, U.S. Department of Energy Solar Energy Technologies Office., work-based learning program on July 11, 2018 by Helen Deffenbacher. 200 Communities Are Now SolSmart Designees! Today, with the designation of Lee’s Summit, Missouri, SolSmart marked the 200th community nationwide to achieve designation as SolSmart Gold, Silver, or Bronze! These 200 designees are in 35 states and the District of Columbia and represent over 59 million Americans. The application process is now open for the third round of SolSmart Advisors. SolSmart Advisors provide no-cost, hands-on technical assistance in communities that are selected through this competitive application process. Each Advisor works in a community or region full-time for approximately six months. SolSmart is accepting applications for both 1) Communities interested in hosting an Advisor, or 2) Organizations interested in serving as Advisors. Learn more here. Attend SolSmart webinars on May 16, 2018 to find out more about the process. Webinar for Community-Based Application: 2pm Central Time. Register here. Webinar for the Organization-Based RFP: 3pm Central Time. Register here. Cutting permitting costs and saving money for customers. For example, West Palm Beach, Florida started a “walk-through” permit process that takes as little as 15 minutes. Engaging with community members to encourage solar development. For example, a SolSmart Advisor helped the cities of Goshen and South Bend, Indiana launch Solarize campaigns, which allow residents to come together to install solar at a discounted cost. Reducing zoning obstacles to solar. For example, Brownsville, Texas adopted a zoning ordinance that will help facilitate the growth of new solar projects. Streamlining inspection processes. For example, Pima County, Arizona launched a “remote inspections” process to provide same-day approval on solar and other projects. Encouraging local job growth. Solar energy employs more than 250,000 Americans. A SolSmart designation positions a city or county to bring these jobs to the local community. Other actions SolSmart communities have taken include installing solar on government buildings, developing “solar-ready” construction guidelines, integrating solar PV with energy storage, hosting community-wide solar workshops, and training local government staff. Visit SolSmart.org for more information. This entry was posted in Nebraska / Midwest News, NewsBlog, Solar Energy Education and tagged Nebraskans for Solar NewsBlog, SolSmart, SolSmart Communities, SolSmart Communities - making solar more affordable and accessible for all, The Solar Foundation on May 1, 2018 by Helen Deffenbacher. SolSmart has announce the opening of the application process for the third round of SolSmart Advisors. SolSmart Advisors provide no-cost technical assistance in communities that are selected through this competitive application process. Each Advisor works in a community or region full-time for approximately six months. 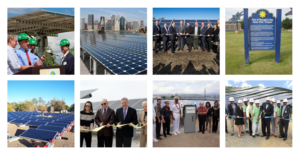 Our previous Advisors have assisted communities in launching Solarize campaigns, modeling solar installations on government buildings, streamlining solar permitting processes, and much more. There are two application pathways and the appropriate pathway is determined by the lead applicant: 1) a local government; or 2) an organization. All applications are due by June 4, 2018. This application is for local governments (cities, counties, villages, and towns) that want to apply to host a SolSmart Advisor for themselves and/or a group of communities. The most competitive applications will include a partnership between two or more communities (a “cohort”), with a larger number of communities being preferable. This pathway is for organizations including, but not limited to, councils of government, regional planning commissions, community organizations, and energy and environmental nonprofits. Organizations interested in acting as Advisors will apply through an RFP. Read SolSmart’s blog post which provides more information on the pathways, application timelines, and a schedule of upcoming webinars on these opportunities. This entry was posted in Nebraska / Midwest News and tagged Nebraskans for Solar NewsBlog, soft costs of solar energy, solar energy development, SolSmart, The Solar Foundation on April 4, 2018 by Helen Deffenbacher. 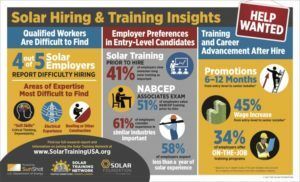 Each year, The Solar Foundation releases its National Solar Jobs Census, a report that tracks employment in the U.S. solar industry. It is the most comprehensive analysis of the solar labor market in the United States, and is a critical resource in educating policymakers and the general public about the economic impact of solar energy. In 2017, the census reported its first decline in solar jobs since its inception 8 years ago. As of November 2017, the solar industry employs 250,271 workers in the United States, a 3.8% decline over 2016. This decrease is largely due to a record year of installations in 2016 on the heels of the extension of the federal Investment Tax Credit (ITC), as well as delays and postponed projects due to uncertainty around the newly appointed Section 201 tariffs. This entry was posted in Nebraska / Midwest News, NewsBlog and tagged Investment Tax Credit (ITC), Nebraskans for Solar, Nebraskans for Solar NewsBlog, Solar Energy Industries Association (SEIA), solar industry jobs, The Solar Foundation on February 8, 2018 by Helen Deffenbacher. More and more schools are taking advantage of their large roofs and open spaces to generate clean power and save money. Solar schools are creating a brighter future by spreading energy awareness to students, parents, and the community. 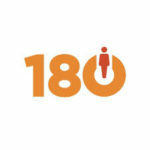 Generation 180 has recently launched some exciting initiatives to empower schools nationwide to take advantage of all the benefits of solar energy. We’ve just launched our nationwide Solar Schools campaign, which aims to help schools go solar with greater confidence and success. In addition to the report, Generation 180 offers how-to resources to empower stakeholders to become solar champions who can effectively advocate for solar schools in their own communities. You can help make a brighter future possible. 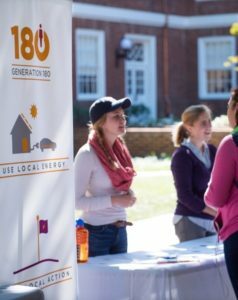 Generation 180 is forming teams of volunteers throughout the country to rally local support from educators, district leaders and community members and providing resources to assist schools in going solar. Contact us to learn about starting a volunteer team in your community. Learn about volunteer teams. Nebraska Solar Schools, founded by Nebraskans for Solar and statewide partners, is a program that provides K-12 educators with resources and tools for incorporating renewable energy education into their classrooms and schools. The resources support Nebraska and national science standards. The program is offered to public and non-public schools, as well as places like schools such as children’s museums, zoos, nature preserves and science and technology centers. This entry was posted in Nebraska / Midwest News, Solar Energy Education, Solar Schools and tagged Generation 180, Generation 180's Solar Schools Campaign, Nebraska Solar Schools, Solar Energy Industries Association (SEIA), The Solar Foundation, Tish Tabian on January 14, 2018 by Helen Deffenbacher. 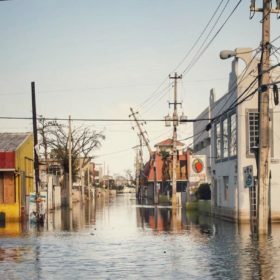 In this interview, Solar Foundation President and Executive Director Andrea Luecke talks about how Solar Saves Lives came together, what the organization is doing now and what it needs. A GTM Research report examines the state of existing and future microgrids, including market and geographic segments and the inclusion of PV and other clean energy technologies. SEIA pushes America First solar policy as industry descends on D.C..
As the industry meets with the U.S. Trade Representative for one last hearing on the Suniva/SolarWorld trade case before he offers advice to President Trump, the national association pushes its latest lobbying message. This entry was posted in NewsBlog and tagged Greentech Media Research, microgrids, PV Magazine USA, Solar Energy Industries Association, Solar Saves Lives, The Solar Foundation on December 6, 2017 by Helen Deffenbacher.